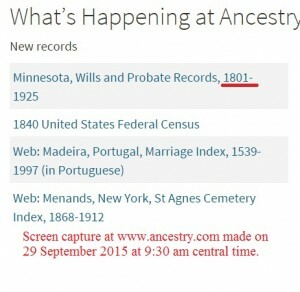 According to the title at Ancestry.com, Minnesota has wills and probate records dating as early as 1801. Somehow I doubt it. I realize that catalogers sometime shave difficulties with materials, but it would seem that a good working start date for probate materials would be sometime close to the date of statehood. 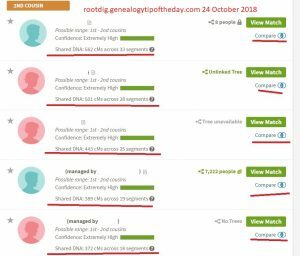 In reviewing the list of titles in the “probate database” at Ancestry.com, it appears that many of them have “start dates” that seem a little early for the location. And even when the years covered seem reasonable for the state in question, read the inventory of what is available for your specific county of interest. 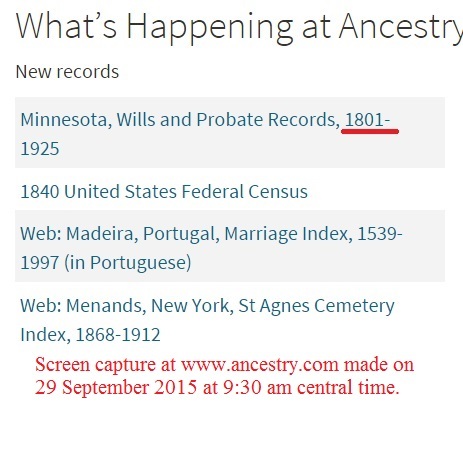 Because I bet there aren’t many Minnesota counties that have probate records stretching back to 1801. Informed users are more effective users. I attempted to search Minnesota sites but Ancestry doesn’t let me in. I had dropped them several years ago.. Hints appreciated..
How complete their probate records for Minnesota are I can’t say. There is a drop down menu on the right hand side that will let you browse their inventory even if you aren’t a member.